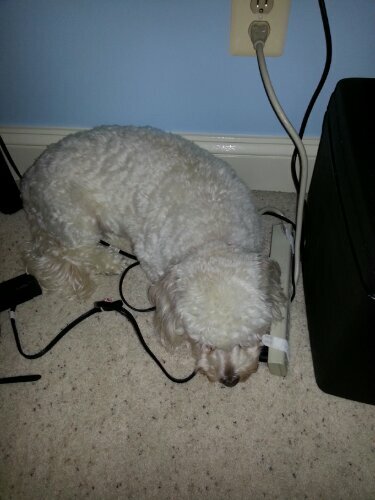 While I was hard at work finishing up a wedding, Buddy flopped himself under my desk and looked so pitiful. You could tell he was begging for attention, so during the far too long time it took for everything to upload, I flopped in thr floor with him and watched random tv shows. Although I have to say I can see Witches of East End becoming a new favorite of mine. It’s pretty intriguing and ended on a cliffhanger which definitely makes me want to watch again next week. Tricky. 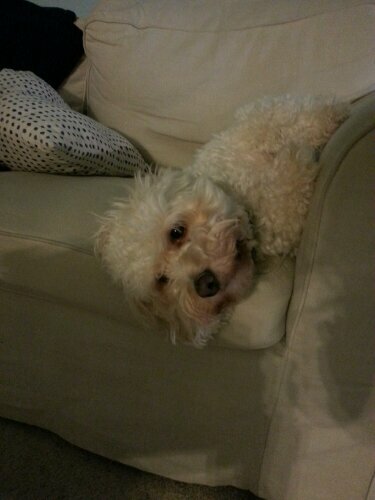 Buddy is always finding new ways to hang out on the couch. This time he was pretty much hanging upside down. Whatever makes him comfortable I guess. 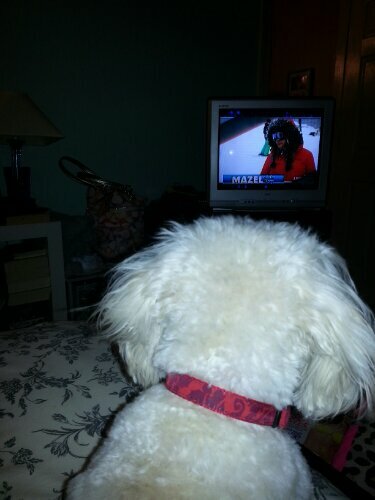 Buddy is such a tv watcher. He gets interested in whatever’s on and stares at it a while until he gets bored. 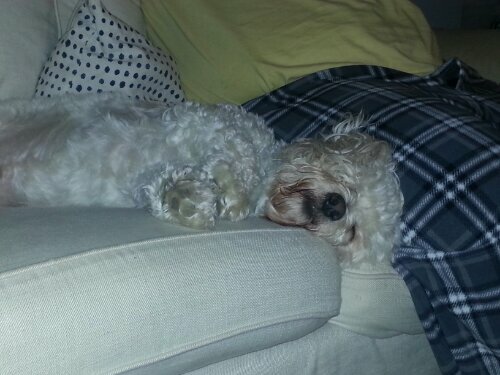 Then he flops back down until something else comes on. Buddy’s August BarkBox came today. It features a water theme. 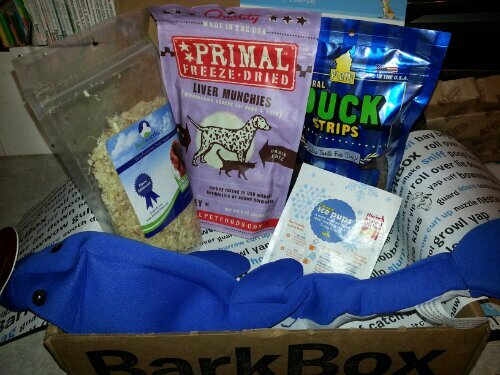 He got duck treats, shredded bully stick treats, another type of treats, some sort of broth mix and a dolphin. He’s a treat dog so he’ll love this box. We haven’t given him anything out of it yet, because we gave him a stuffed duck toy that we brought home from the beach instead. Which he destroyed in just a few minutes. These two are so lively. Ron falls asleep and Buddy lays down and copies him. 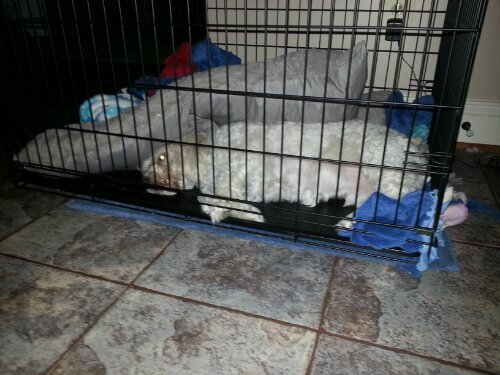 The funny thing is Buddy even sometimes copies the exact position the person is in. 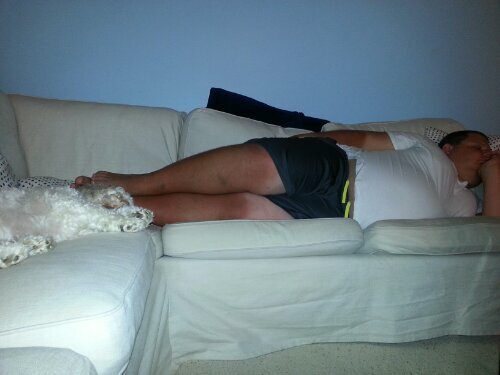 I’d try to copy him next time he falls asleep, but I don’t think I’d be able to posistion myself like he does. We’re back from the beach and Buddy is so happy to see us. Can’t you just see his excitement? 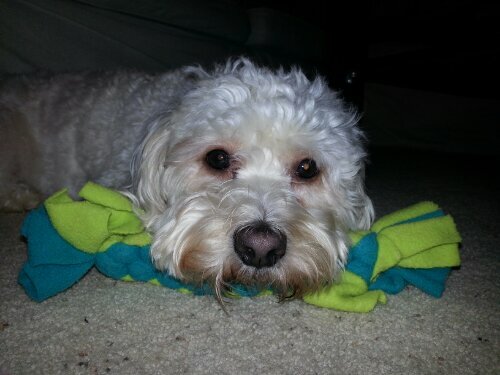 I’m excited to go to the beach this weekend, but I’m not excited to leave Buddy. I know he’ll have a great time on his own vacation and will be well taken care of, and spoiled, but I’ll still miss him and worry about him. He loves my parents though and he gets a kick out of testing out all the beds in the house, snuggling up with them and finding new things in their house to play with. He’ll have a great week while we’re gone and then flop once we get him back home because of all the fun he had during the week. I’m glad he has a place to visit that he enjoys and that they enjoy him as well. I worked late today and then finished up some stuff at home. When I was finished Ron and I caught up on tonight’s episode of “Under the Dome,” which I’m obsessed with. 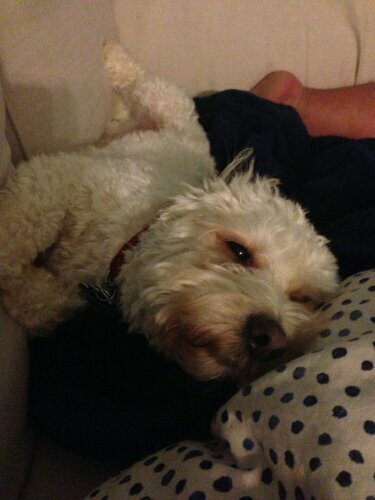 I guess we stayed up too late for Buddy since he sacked out on the couch and took a nap. Either that or he’s really annoyed at the lack of dogs on trapped within the dome. 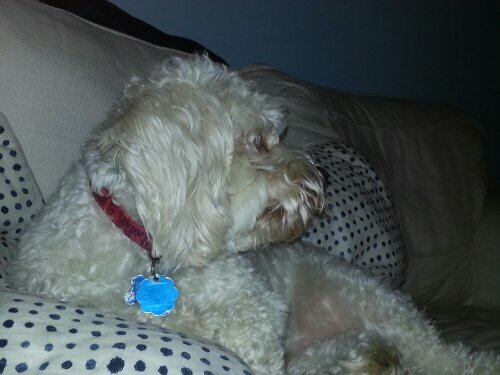 Buddy’s enjoying some Real Housewives of Orange County recaps courtesy of Watch What Happens Live. I know. I should really turn on some Animal Planet for him every once and awhile. No one can say Buddy isn’t unique. Why he chooses to sleep under the pillow is beyond me. My guess is it’s cooler, but the ceiling fan is on and it isn’t really hot so I have no idea. It must just be his preference. To each their own.